With his second 400-yard game of the season Sunday, Carson Palmer finished with 4,274 passing yards and 24 touchdowns in his first season in Arizona. GLENDALE, Ariz. — Carson Palmer made history Sunday, becoming the first NFL quarterback to throw for 4,000 yards in a season for three different teams. It took him three years to get there with Cincinnati and two with Oakland, but he needed only one in Arizona. Imagine what it would have been had the offensive group did not have to assimilate Bruce Arians’ system on the fly. "There are more wins out there," Palmer said. "This offense is something that can be very dangerous going into Year 2, where everybody has a good feel for the calls and hots (reads) and protections and concepts, where everybody knows every route. … That’s exciting. As much as it stinks to have this feeling right now, I’m excited about the future." The immediate future seems assured. With his second 400-yard game of the season, Palmer finished with a career-high 4,274 yards in his first season in Arians’ pass-oriented system. He threw 24 touchdowns and a career-high 22 interceptions, but 13 of those interceptions came in the first seven games, the anticpated learning period, Arians said. How good is Arian’s scheme? Despite another year of experience, Indianapolis quarterback Andrew Luck passed for 800 fewer yards for the Colts this season, one year removed from Arians. Palmer was the subject of growing criticism after his slow start, and there was some speculation that it might be time for Drew Stanton to get a chance. That was old thinking, perhaps a product of the past, when the Cardinals ping-ponged between seven quarterbacks from 2000-12 because of injuries and ineffectiveness. Arians resisted a knee-jerk change in midseason and stuck with Palmer though his ankle and elbow injuries, and with Palmer under contract at $8 million next season, with $2 million of that guaranteed, it appears Arians has found his man, even if he will be playing at age 35 next year. "He’s as resilient a guy," Arians said. "I can’t say how tough a guy he is mentally. You know something good is going to happen sooner or later, because he is going to keep slinging it in there." 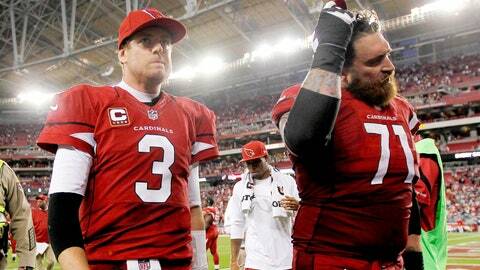 The Cardinals were 3-4 after a 34-22 loss to Seattle on Oct. 17, a start that did not really surprise Arians. "The first year into a football franchise, you go eight games and you don’t really expect that much. That’s your learning process," Arians said. "The second half of the season is when you judge how far you’ve come." Palmer’s passer rating, 69.5 through the loss to the Seahawks, jumped 30 points in the second half. He finished with an 83.9 rating as he, Larry Fitzgerald, Michael Floyd and the rest came to feel more comfortable. "This is a very complicated system. Let’s not kid ourselves," right tackle Eric Winston said. "And ‘B.A.’ installed everything in three days. It was kind of a saturation process. I don’t care who you are, I don’t care how long you have been around, everything is not gong to click (snaps fingers) automatically. Guys kept working at it. Guys kept thinking about it. "A lot of people want to say, ‘Oh, Carson finally figured it out.’ It wasn’t just Carson. Everybody figured it out. There were times when Carson threw it to the right spot and guys weren’t there. It was a collective effort." A lot of people want to say, ‘Oh, Carson finally figured it out.’ It wasn’t just Carson. Everybody figured it out. While there may be criticism on the outside, Palmer has his loyalists in the clubhouse. Teammates have found a player they can rally around. Veteran Darnell Dockett, who went to the Super Bowl with Kurt Warner, is among the believers. Palmer was in Dockett’s hotel room Saturday night at 10 p.m., watching film at the same time he was getting treatment from a specialist Dockett enlists. "He’s a warrior. You can win with a guy like that. He throws a few picks, who cares? He’s going to do everything he can do to win a football game. Some guys that I’ve seen would have clocked out on us. One hit and he would have been out nine weeks," Dockett said, mentioning no one in particular. "That guy (Palmer) has been playing hurt all season. Don’t make no excuses. Come to practice. Do treatment before. Do treatment after. As a guy who has been here 10 years, I can appreciate a quarterback like that. That’s what I’m talking about with a winning attitude. Him and Kurt are the best two quarterbacks I’ve played with. And it’s not because they can throw touchdowns and make smart adjustments. It’s because they are tough. "You know you are going to be hit. You know you are going to get hurt. You know in Week 10 you won’t feel like you did in Week 1, but what are you going to do to help the team win? We’ll sacrifice for him." 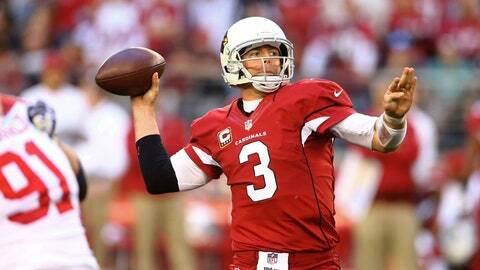 As far as reaching 4,000 yards again, Palmer said that is not the number he pays attention to. "Personal goals are always nice, but I wasn’t worried about it, thinking about it. I was thinking about wins and losses," he said. And he believes the best is yet to come. "When I start doing my study and my breakdown, I’m going to learn a lot. I’m going to gain a lot. There are a lot of things I learned as the season went on. There are a lot of experiences within certain plays and within certain protections I kind of figured out, and those are things you don’t figure out sitting in a classroom and being drawn up on a chalkboard. "We’ll see what happens next year. We’ve started something special."